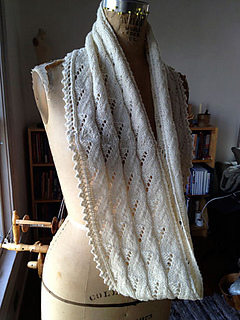 A billowy infinity scarf to knit in several sizes (petite/medium/tall) with an openwork pattern that makes a feature of yarns with a soft halo. 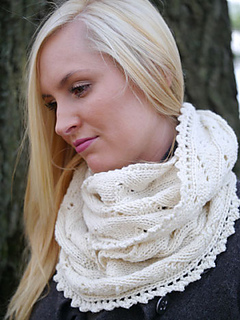 Knit vertical in the round as a circular cowl or begin with a provisional cast-on and work flat lengthwise to create an infinity scarf (a flat scarf is also an option). The motif is very easy to memorize and the pieces grow quickly, making this project a good choice for that last minute gift or for a beginning lace project. Use slightly fuzzy yarns that bloom to lend body to the fabric. Substituting yarn and/or needles may result in an overall variation in size and drape.